Attach a colorful trio of reusable balloons to any non-porous surface with this Reusable Balloon Trio Suction Cup Kit. Our exclusive helium free balloon kit is the perfect alternative to hassling with new balloons every day or every event. Now you can attach 3 balloons to any surface with ease using the Reusable Balloon Trio Suction Cup Kit. Because 3 Balloons Are Better than 1! 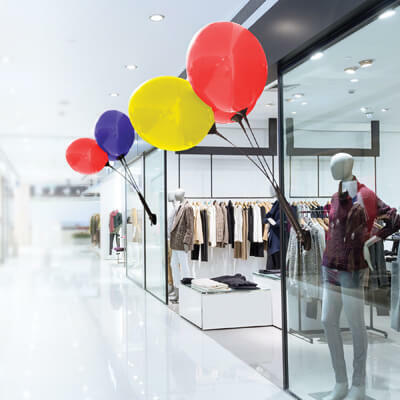 You probably already know about the benefits of using colorful inflatable balloons in your business. They are a great way to make sure you stand out and get noticed by more passers-by, which can send more business your way. They are also a quick and easy way to add some color to your premises. Now you can easily attach 3 balloons in one by using our Reusable Balloon Trio Suction Cup Kit. Simply attach the super-strong suction cup to any non-porous surface and you’ll instantly be able to insert 3 inflatable balloons using any color combination you want. Our helium free balloon kit is sure to be a hit! The Reusable Balloon Trio Suction Cup Kit does not require any special setup process, making it a quick and easy way to display inflatable balloons. We have many more balloon products in our store that can help you to make your business look amazing. Check out our Reusable Cluster Kit, Reusable Balloon Ground Kit, Balloon Replacement Packs, and more. Also see our Quick Flow Deluxe Balloon Inflator to quickly blow up the balloons without getting out of breath. We deliver to all USA addresses in 1-5 days so you never have to wait around longer than you should. 1-5 days anywhere in the USA.